Alveolar bone defects may result from congenital malformations, traumatic injuries, periodontal disease, surgical trauma, chronic periapical lesions and benign or malignant tumors. The causes of resorption of the alveolar bone after tooth loss, are related to its atrophy due to loss of function, reduced blood supply, local inflammation or inadequate pressure from the prosthetic device. After the loss of teeth, the resorption process of the alveolar bone begins with the fastest rhythm in the first few years and with predictable flow – the labial part of the alveolar process is the place of the fastest resorption, with the largest reduction in the transverse and vertical direction. Bone resorption is thought to be 40-60% during the first three years of teeth loss, and then decreased by 0,25-0,5% of the total lost. The use of a barrier membrane for the prevention of tissue invasion that can compromise the regeneration. This criterion is successfully applied to create bone in extraction wounds in deficient alveolar ridges, with a significant increase in the alveolar ridge, especially when it comes to defects in buccal lamina, I which case augmentation is necessary. Some of the methods of preserving and reconstructing the alveolar ridge today are overcome and can only be a temporary solution. Instead of them, the immediate placement of dental implants in an existing alveolar bone, or delayed implantation in the grafted alveolar bone, is a usual choice in the reconstruction of the dentoalveolar skeleton. The importance of bone preservation, when it comes to the alveolar bone, is imposed as priority, and therefore reconstructive techniques and materials of human and non-human origin are used and developed on a daily basis. There are numerous techniques that allow maximizing the available alveolar bone, without using bone grafts. Osteocondensation – one of the techniques that can alter the morphology of the alveolar bone with condensation of the bone in various directions, using appropriate osteotomies. – another method that achieves the expansion of an existing alveolar ridge, by making a greenstick fracture on the alveolar base. The greatest benefit of this technique is the possibility to expand a thin alveolar ridge to a width that is sufficient to accommodate implants, without using bone grafting. – used for small augmentation procedures. 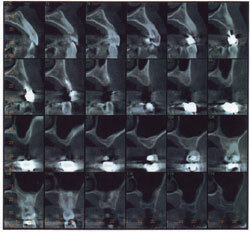 The technique is in fact prevention of soft tissue growing into the bone defects, using bone substituent materials and resorptive (collagen) and non-resorptive (metal or titanium) membranes. – used on long bones in children, to extend the bone without bone graft. In the oral and maxillofacial region, it is used as an augmentative technique with making a bone fracture which results with an empty space that initially closes with callus and later matures into bone tissue. The alveolar ridge distraction is initiated from the second to the seventh day of primary osteotomy and ranges daily from 0,25mm to 0,5mm, it is performed continuously for 30 days (with a final result of + 4-7mm new bone tissue). – a property that is expressed through bio-tolerance, bio-integration and bioactivity of the material. – described as bone growth through material from autogenous, allogeneic or alloplastic grid. It relates to materials that serve as a grid in which the newly formed bone grows. This process occurs only in an environment in which bone tissue already exists. Materials with osteoconductive potential are applied in bone defects with osteoinductive potential. – refers to the ability of the graft material to induce undifferentiated stem or osteoprogenitor cells to differentiate into osteoblasts. 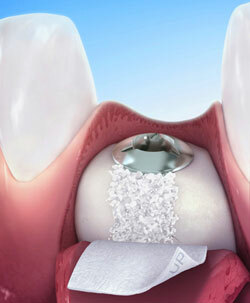 – a bone graft that is transplanted directly from one region to another in the same individual. It is a „gold standard“ among bone grafts, as it contains all three elements necessary for bone formation: grid for osteoconduction, growth factor for osteoinduction (they contain bone morfogenetic protein) and progenitor cells for osteogenesis. These grafts may be vascularised (more complex for preparation) and non-vascularised (cortical and spongy). Autogenous spongy bone grafts have better results with faster revascularization. Extraoral donor places are: the iliac bone, proximal part of the tibia, femur. Intraoral donor places are: the mandibular symphysis, ramus and retromolar area. Despite all the advantages of this graft material, it also has certain disadvantages such as: secondary surgical intervention is required which brings increased morbidity, higher incidence of infection, bigger blood loss, increased risk of intraoperative and postoperative complications, unpredictable bone resorption (up to 30%), slower patient rehabilitation, higher costs. – a non-vital tissue that is transplanted from one to another individual. There are three types of allogeneic bone: fresh frozen bone, demineralized frozen dry bone graft and demineralized bone matrix. All of these variants usually come from bone banks. Today, the most commonly used allograft is demineralized bone matrix and after its application, bone regeneration of 50-70% new bone tissue has been proven for 12 weeks. The main disadvantage of this material is its high cost. – graft materials that are produced from bovine bones by means of double deproteinization and have an osteoconductive potential (Bio Oss). Xenografts are slowly substituted in a human bone and the process lasts for at least 10 months or more. They come in the form of granules or powder, requiring application of membranes to keep the material in the desired position. – materials that have osteoconductive and osteointegrative potential and serve as a substrate around which a new bone is formed. The most commonly used alloplastic grafts are: hydroxylapatite, tricalcium phosphate ceramics, bioactive glass and calcium sulphate. – a special category of bioactive molecules, which are not classified as osteoinductors nor as osteopromoters, because they possess the both functions. The most commonly used biologically modified graft materials are Emdogain and Pep-gen.